Gukbap, literally meaning "soup rice" is a description that can apply to quite a few varieties of soup in Korean cuisine. The essence of gukbap boils down to the soup which is usually nutrient and flavor-rich. Varieties include ones where the soup is made with dried pollack, ox bones, or even ox blood! Their popularity in Korean cuisine is attributed historically to two main things: 1. Soup can be stretched to feed a large group, such as family, back when the choices for eating was slim and 2. A way to recover after previous night of excess drinking. Jeonju itself, in southwest Korea, has a type of gukbap it's particularly well known for and it's one that uses copious amounts of soybean sprouts which, with its ample levels of vitamin C, enzymes, amino acids, and other nutrients are said to be great for hangovers and overall immune system boosting. Located in recently trending Seongsudong, just near Seoul Forest, Bisaebeol Jeonju Kongnamul Gukbap is located in an unassuming alley. But once you're near you'll know you've come to the right place because you'll hear the chatter from all the people inside and the people lined up outside. The lines are somewhat more alarming when you note how spacious the inside is with plenty of table space. Note the sign on the right that notifies customers Bisaebeol operates 24 hours a day. Such is the demand for their gukbap! As a sign of their expertise, Bisaebeol has but two items on their menu only. The first being their kongnamul gukbap (soybean sprouts gukbap) and the other a makgeolli-based drink called moju in which makgeolli is boiled with a combination of herbs that is said to be medicinal and invigorating. Please note the prices as well- only 6K for a bowl of their soup (plus rice and other side dishes) and 1K to knock back a glass of the moju. 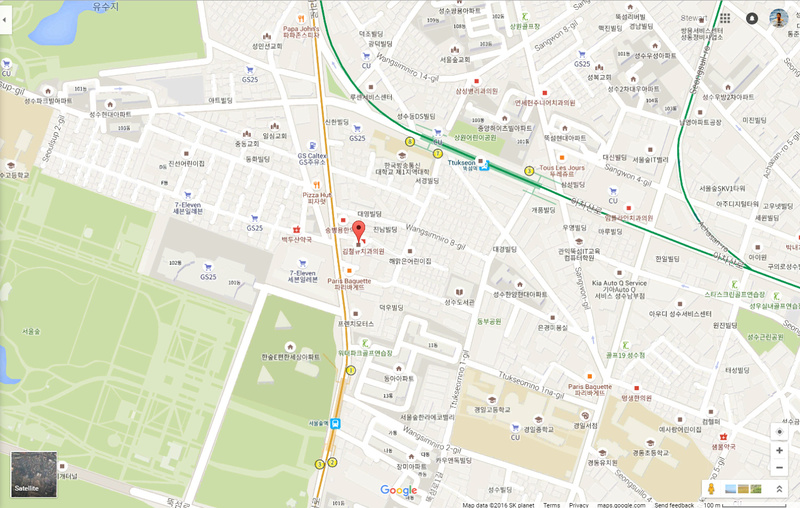 The "bisabeol" in the establishment's name comes from Jeonju's former name. And, as mentioned, kongnamul gukbap is a dish commonly associated with Jeonu. As their menu explains, they take pride in the fact that the soup stock is made from taking an assortment of some 20+ ingredients, including hwangtae (dried pollacks) and boiling it together for 24 hours. Now, visually-speaking, the soup here is more than meets the eye as the soup, as clear as a bowl of water, comes with a mound of soybean sprouts, chopped scallions, and just a sprinkling of red pepper flakes atop. Take a sip though and you'll know this is the good stuff. Refreshing as it is deep, this is soup with soul that fills more than your belly. Provided on the side for personal preference are chopped chili peppers (of the spicy kind) and sewoo jeot (brined tiny shrimp) to add flavor. Taste and adjust accordingly. You'll notice that they also provide a warm metal bowl that has some eggs cooked over easy. This is actually provided at all Jeonju-style kongnamul gukbap places as the proper way to eat is to pour some of the hot soup into the bowl with eggs to enjoy the soup in two different ways- one "pure" and neat while the other is a more creamier, heartier version. Going back to the price and value for Bisabeol, take a look at all that you get for a mere 6K. They're very attentive in refilling the sides too! Bisabeol Jeonju Kongnamul Gukbap has only soup on its menu but this is soup with soul. A versatile soup that can be enjoyed by all ages and regardless of the state you're in (sober or not) this is one of the best value meals in this part of town. From exit 1 of Seoul Forest Station, head straight for about 150 meters until you reach Wangsimniro 6-gil and turn right. Walk about 20 meters and you'll see the restaurant on your right. Alternatively, turn right as soon as you head out exit 7 of Ttukseom station and walk south for about 150 meters until you reach Wangsimniro 6-gil and turn right. Walk for about 50 meters and you'll see the restaurant on your left. Their moju is a medicinal, alcohol-based drink but I believe the cooking process eliminates most or all of the alcohol. The restaurant is open 24 hours!